I’m a quilter, living in Wisconsin, where the long, dark, snowy winters definitely lend themselves to spending hours with fabric and thread quilting. Tho I love all types of quilts, applique is my passion and many hours can be lost designing new projects with EQ and sharing many of them with my quilting friends on The Quilting Post (TQP) an online quilting list which I help run and now sharing some of them through this blog. Through 4-H in grade school, I began my love of fabric by sewing most of my own clothing. That continued until about 25+ years ago or so when I decided to try quilting. No longer was there time to be sewing clothes — I had quilts to make. So this blog is my tale of quilting travels, fun with friends and family and whatever else happens to strike my fancy. I also knit and crochet and am especially hooked on knitting socks. Hand dyed yarns are just as addictive as beautiful fabrics. Hello – I was in a class at least several years or more ago and we were constructing “Grannies Hankie” – I had to drop out of the class and never finished the quilt. I just took it out today and realized that I am missing some of the instructions – can I still get them? Susan – I just saw your message – wordpress didn’t send it thru to me – so sorry for the slow reply. But no, Grannies Hankie blocks are no longer available. If I remember correctly I incorporated some of those blocks into my Miss Daisy’s Garden block collection available thru Electric Quilt but you must have EQ software in order to use/print that block collection. Do you have a sheet of My Crayon Box Section parts? Betty – I’m not sure what you mean by a sheet of parts. I find no e-mail address. I have a question about the Bom. I have 2 blocks from you and Judy, but 3 of Sheryl (Dove, Pointisetta and Christmas bells. Is that correct? Is it possible to make a website where you can find all the patterns that are published? Thus one could always there check if you have collected all the patterns and ambiguities were removed. Unfortunately I can not find your e-mail address still Sherylls address, so I try to find an answer here. Sorry for my bad English. I hope you can understand me. You should have two block patterns from each of us. If you look at the Christmas Bell block you will see it is Susan’s block not Sheryl’s. From your list it looks like you didn’t get Susan’s first block, the Three Trees so you need to go back and get that from her blog. Part of the plan of this project is that it is a blog hop so having all the patterns in one place would negate that aspect of this project. This is Beverley from the romp of 03 or 04 Good to see you. Bet this Christmas quilt will be great with all those quilters together. Hi Denise. I saw Block #316/Balancing Act in Volume 4 of 100 blocks. I know there is a whole quilt/wallhanging that goes with that cute little puppy. Can I order it? From you or from WHERE? Hi Donna – if you are talking about the little wallhanging I made from that block that is in the back of the 100 Quilts magazine – there is no pattern for that. If you are talking about my other dog pattern that had other dog blocks in it – its in a past issue of Quiltmaker — September issue? I can’t remember off the top of my head. Denise: I’m an avid sock maker also. I don’t accomplish as many as you do, but I keep trying. I also Spin my own yarn, weave my own fabric, dye some of my yarns and fabrics, make cloth dolls, and quilt. I have explored your archived blogs and I just love most of your quilts. I plan on picking up the Sept/Oct. issue of Quiltmaker for the Dog quilt. I think it is just so cute. Now that I have found you, I will try my best to keep up with any free patterns that you post. Thanks Melanie. I need to get back to the sock making soon. I’ve got about 6 or 8 single socks that all need the pair made so I have new ones to wear this winter. I love your patterns. For June, how about thinking WEDDINGS or ROSE GARDEN? I found your blog!! Love the Harriett Bunny — Reminds me of the set you made for me so long ago!! I still have them. Gotta tell you that I ventured into the fabric store today. I’m gonna try to sew something. After all, I used to sew stuff all the time with my kids around, so the grandson will just have to deal with it!! just found your blog on the EQ7 web site (new member) and your quilts are a great insperation to me. will look more when I have time. Hi Denise, I feel so bad about the e-mail. I really did not send an attachment with it. Don’t know what happened. I just wanted to compliment you on your work. I recently bought EQ7 and wanted to know if the EQ6 patterns can be used with it. I’m still a novice when it comes to designing my own quilts and would appreciate any tips you’re willing to share. Thank you for sharing your lovely patterns with your fellow quilters. No problem Joey. I “think” you might be able to use the EQ6 designs even if you started with EQ7 and didn’t have EQ6. This is just a guess since I can’t test it since I have both 6 and 7. But if you download the file to “save” to your computer (rather than just directly opening the download). Once it’s saved, go in and rename the file changing the .pj6 to .pj7 and resave. I think then you may be able to open it in EQ7. That’s the only way I think it might work. As for tips – you just have to sit and play with EQ to get the hang of all the great things you can do with it. http://www.quiltuniversity.com also does EQ classes on line that are well worth the nominal fee. Hi Tara – glad to be found! Wacky hearts is a fun one. According to an online translatgor, it looks like our message translates to: “Hello it would want to you to comment if I send the photo to you or nonesnecesario already I have made the first block and I leave a month vacations if you could send to me and to two block iria doing since 12 day not estare A greeting from Barcelona Angels ” It is no necessary that you send a photo – you only need to if you want me to post it on the block of the month page with other finished block photos. It looks like the second part asks that I email you the 2nd block — the blocks are only available to download yourself during the time period they are available. According to an online translator, it looks like our message translates to: “Hello it would want to you to comment if I send the photo to you or nonesnecesario already I have made the first block and I leave a month vacations if you could send to me and to two block iria doing since 12 day not estare A greeting from Barcelona Angels ” It is no necessary that you send a photo – you only need to if you want me to post it on the block of the month page with other finished block photos. It looks like the second part asks that I email you the 2nd block — the blocks are only available to download yourself during the time period they are available. November 17, 2008 Visit with the Family. LOL – I must have been looking at the comment above or below yours when I was typing the reply and picked up a different name. I’ll have to see if I can find that pattern book back since it’s been a while since I made them. Hi Denise. I just happened upon your website and see that you made the crochet Hot Boots by Dorothy Warrell. I attempted them tonight but found myself completely confused when I got to the “top” instructions. Do you have any helpful hints? I know that it shouldn’t be that difficult! Dorothy – I’m assuming there’s a photo of them on my blog but I’m not recognizing the name of them. If you remember what day’s post you saw them on I can take a look and see if I can help. My name is Samantha and I am a crocheter who is also attempting to make the “Hot Boots” by Dorothy Warrell. There is a picture of them in your blog post from November 17, 2008. The pattern that I have for them is in a book by Annie’s Attic called “Hooked on Crochet! Slippers”, pg. 7. I am having quite a bit of trouble figuring out the “top” of the slippers as well and would really love to make these for a gift! I have the bottom made and it looks great…do you think you could help me figure this out? It would be greatly appreciated! Hiya Denise….followed your link from Judy’s Stash report. Where in Wisconsin are you? I’m around 60 miles north of Eau Claire just off of Hwy 53. Always fun to run into other Wisconsin quilters :0) Get loads of snow yesterday? Have just found your site via Judy L’s stash report. Would love to subscribe to your site. Your creativity is inspiring. Denise, remember me? Jean (aka Wiegel)?????? Long time no see. How have you been doin’? I am at work today, but all of a sudden you popped into my head. I found your blog and have to say that I love how you keep track of your purchases! The “stashbusters” blog is so great. I need to get a better handle on the fabrics I have…and the fabric I buy and bring in. Great blog! LOVE IT. 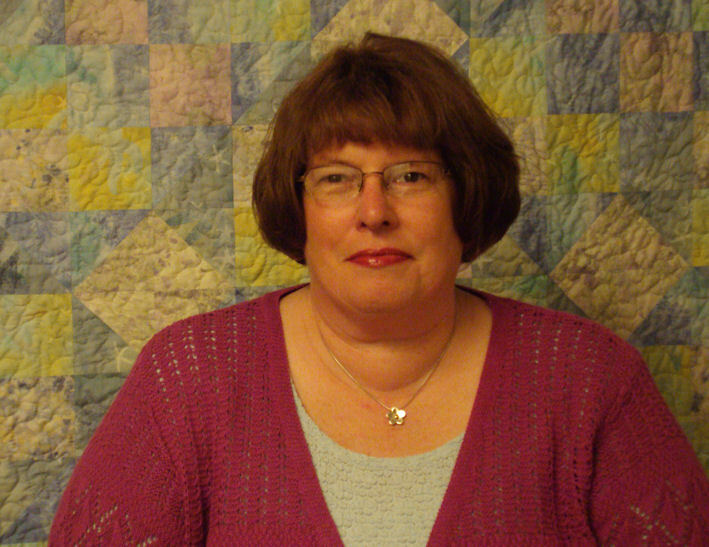 Joy – Judy at http://www.patchworktimes.com has a stashbusting report each Sunday that many of us add our links to. Sometimes the stashbusting is good, others we all fall off the wagon but it’s fun to see how everyone does. I would love to start your BOM in July and have decded to to this in neutrals, dont usually use these colours, as a matter of fact neve have, will give it ago…..he he he. Thanking you in advance for your lovley BOM. Glad you’ll be joining in Jill! Wow – you really make a lot of fantastic quilts. I love them all, but my favorite is the snow globe quilt. I would love to make one for my granddaughter who colllects snow globes. I do not have the EQ6 program and would be willing to ay your for the pattern. I will have to start looking for the perfect fabric, I don’t want to limit the snow globes just to Christmas. Thank you for the inspiration on your blog. Thanks Norece. The snowglobes design was originally done for The Quilting Post online group for a swap and the block pattern was only available to them. It will however be made available publicly on Hoffman California’s website when the holiday fabric line it was redesigned for comes out later in the year. I’ll post a link when the pattern is available through them for download. Denise, your Crop Circles quilt is fabulous (also love the colors you’ve chosen). I’d love to mention this in the Feb. EQ newsletter which goes out at the end of January. Think this would give people a chance to get the January pattern before Saturday Feb 2nd when it will no longer be available. Very, very, very cool quilt! Penny – I’d be glad to have you include it in the newsletter. Thanks! hello Denise, I never noticed before that you had a blog… came to explore and found the wonderful little hedgehog ornament… I collect porcupines and hedgehogs…. can you give me any information on him….. would love to try to find one.